Over the weekend we went to the Jazz Room, a smaller intimate venue in Charlotte, where we saw a pianist, Chad Lawson ,play Gershwin. Loved it! I am a lover of Jazz Standards and the tune “Let’s Call the Whole Thing Off” was one of Gershwin’s tunes the jazz band played at our wedding….it was supposed to be funny. I am sure by now you know that I graduated at Duquesne University’s School of Music with a B.A in Guitar Performance, and Music Education. I went for further education a few years later to receive my M. Ed. My main interest began when I was 10, playing guitar. I still remember the first tune I learned-“Dust in the Wind”.from .Kansas. I would later get books by John Denver and enjoyed playing folk and rock tunes. In high school and later, my inner rocker was released…. 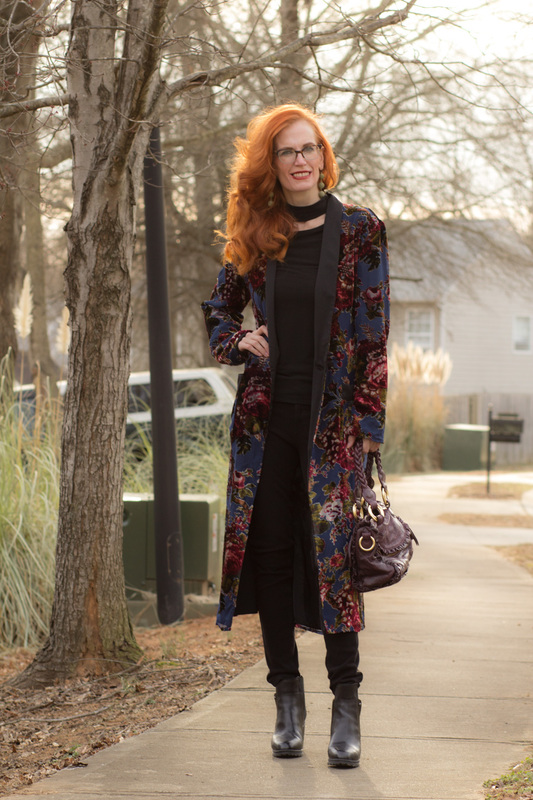 now, years later, I feel that with this outfit I am wearing…A long floral velvet kimono/duster, black jeans, and block heeled black booties, kind of gives off a “Stevie Nicks Vibe”. Santa brought me this blue floral velvet kimono for Christmas as it was one of those other pieces i kept looking at on Zara’s website. Ahh, I knew I wanted to branch out a bit in style this year.. and I do love the longer dusters and cardis I see ladies wearing. I also have a collection of moto jackets ( faux leather and leather), so rock and roll style is attainable! Hubby and i had a discussion lately about the music that we used to listen to. I was very much into Stevie Ray Vaughn, Clapton and old blues later in college. I played in a blues band, but stuck out like a sore thumb, as I bought a pink BC Rich Warlock bass guitar from a fellow classmate. It was hot pink, with heavy metal shape…. Alongside of listening to blues, I love rock and jazz as well. Studying Music, I have a wide variety of tastes.. i’ll enjoy listening to Cat Stevens one day, and the next, Cherry Poppin Daddies, then maybe some Metallica..
. When I taught guitar in my 20s, it was the era of Grunge. Lots of kids coming to me to play tunes by Nirvana, Smashing Pumpkins. So, as far as fashion goes, I suppose that is what i think of when I look at plaid flannels… Anyway, this was such a fun look for me, I love the longer kimono/cardigan look, I will add a few more styles to my wardrobe. Do you ever enjoy dressing like a rock star? Does music ever influence how you dress? 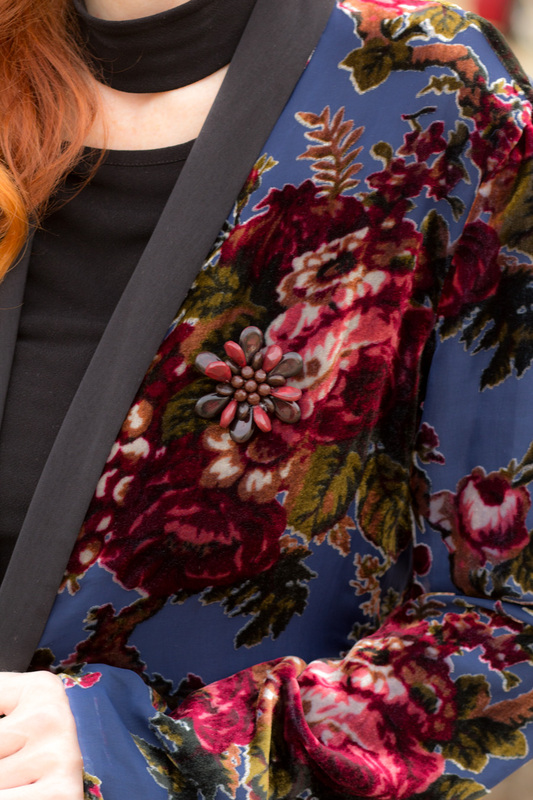 This floral velvet kimono is stunning on you! I’m literally obsessed with it. I feel like this would be a great night time indie-rock look for Coachella ! That kimono is just drop dead gorgeous, I love the floral print on it and the colors as well! The all black look under it is chic and I love the little slit in the tee around the neckline. So pretty! Love the kimono!!! So pretty!!! You are giving all the rock stars a run for their money in that great coat!! Gorgeous as usual. Yes Santa was very good to you. I absolutely love this kimono on you, it is rich and beautiful . 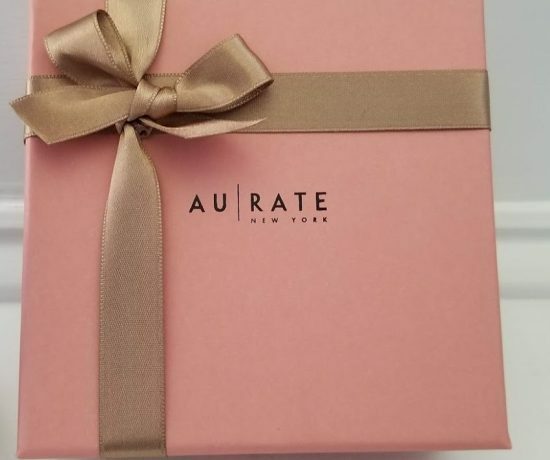 You look fabulous wearing it. I’m so glad you enjoyed the jazz. I hope you’re feeling well. Oh my gosh that is one beautiful Christmas present! I can see that will be on repeat throughout the seasons! I am looking for something like this with lots of color. 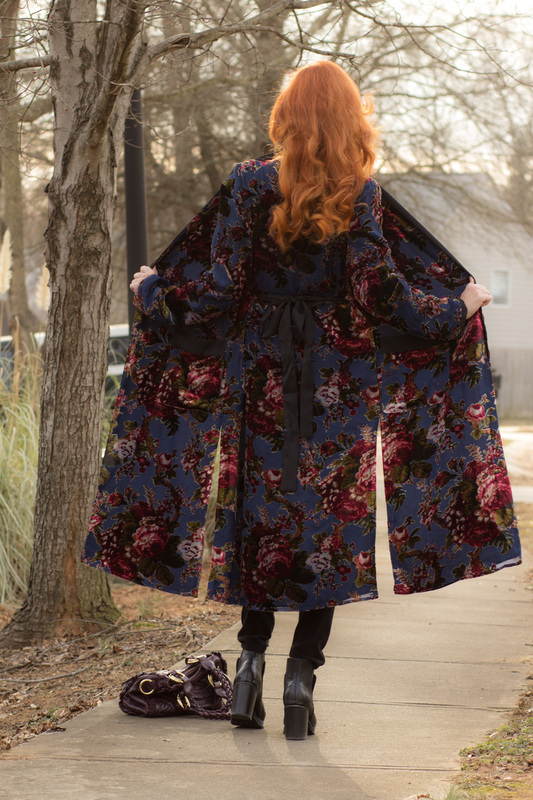 Love your velvet kimono! The colors are lovely and you wear it well! That Kimono is gorgeous, the shape and the detail is all beautiful. Beautiful accessories! That velvet kimono is a show stopper! I typically think of kimonos as a summer layer, but this one is perfect for colder weather! Beautiful kimono! I’m all for chanelling Stevie Nicks, I love her style! Your guitar is fabulous! I have a 1960s Gibson SG that I got signed by Joe Elliott of Def Leppard. I’m still waiting for Angus to sign it! Did you name your pup Gibson after the guitar? obsessed with that coat! you rock it! What a gorgeous kimono—it’s rock and roll, but elevated. You look beautiful! In love with your kimono- really beautiful! I have been wanting a velvet kimono for a while now, in love with this one!! The colors and pattern are gorgeous! Also, how fabulous is that guitar? 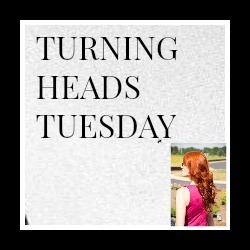 Thank you so much for the feature Jess! Love your rock and roll look and by the way I love jazz too! Beautiful kimono, Jess! Thanks for the link up! I enjoyed reading more about your musical background. This duster kimono is gorgeous and looks fab with your all black ensemble! I really like the choker neck top, too. Stay warm this week! This kimono is amazing, doll! Great piece! Jess! That is such a gorgeous kimono and you have the perfect silhouette for wearing it! I love it. And, could you be any cooler…a guitar player? Seriously, awesome! What a great coat! Perfect for a festival. Great colors on you. You look stunning in this coat. I love the long cardigans/kimonos! And I love everything about this look, Jessica! This outfit is so you and your past, Jess!! What an incredible find!! Oh I am so jealous! 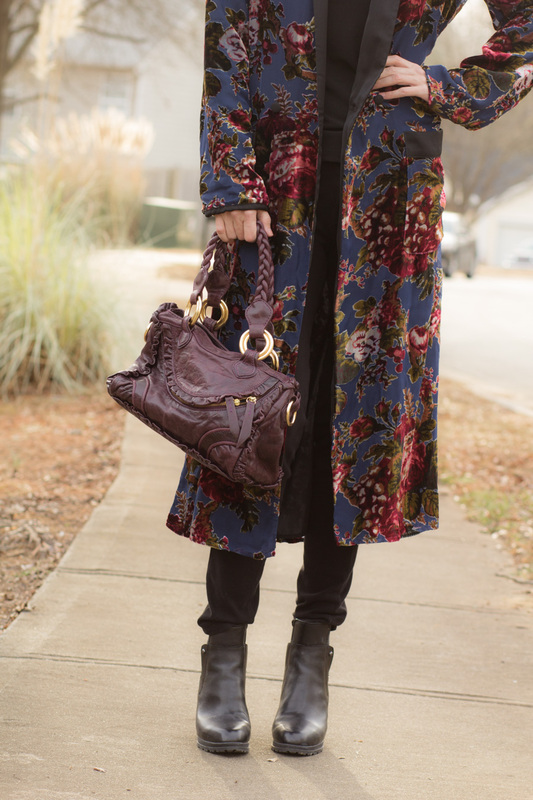 I love that floral velvet Kimono! What a statement piece! I actually bought this kimono too! It was my first velvet kimono piece and I know there will be so many ways to style it, especially come fall. It looks great on you, Jess! Hope you had a nice weekend! I always wanted to be Stevie Nicks so I might just need that fabulous kimono! I just hope I wear it as well as you do! Have a great day! Wow! Fabulous look. I was in a Jazz hotel last weekend where there was a band playing at breakfast! I love that velvet kimono on you! I was just thinking to myself earlier today that despite all of my kimonos and my love for them, I don’t have a velvet one! Maybe a gap I need to fill in my wardrobe when it gets cooler (I imagine it would be too warm for our current Brisbane summer!) Thank you for the link up! My sister works for Davitt and Hanser who make BC Rich guitars and she goes to NAM Conventions twice a year!!! Love your guitar and your robe…love a rock edge vibe in my clothes too!!! That kimono is amazing on you! Jess, I love, love, love this look! That velvet duster is so amazing! I just styled a duster kimono which should be on the blog this week sometime…and I was totally feeling the Stevie Nicks vibe, so I did the photos in front of a guitar store! And your pink guitar! Yes, indeed, I can picture you rocking out on that beauty in any band. I loved all this musical background in this post, too. Fabulous post. Stunning look! Oh this is such a beautiful look. That jacket, Jess, is divine! Hope you have a lovely week, friend! You are a beauty, that kimono is a beauty and so is that awesome Rich Warlock! You wold look fierce playing that, I’m thinking in all black. LOVE the rich colors in that kimono! That guitar would stand out anywhere, it’s insanely cool! And that kimono? You know that I obviously am in love with it. Santa was indeed good to you – that duster is gorgeous! Nice nod to Stevie Nicks! 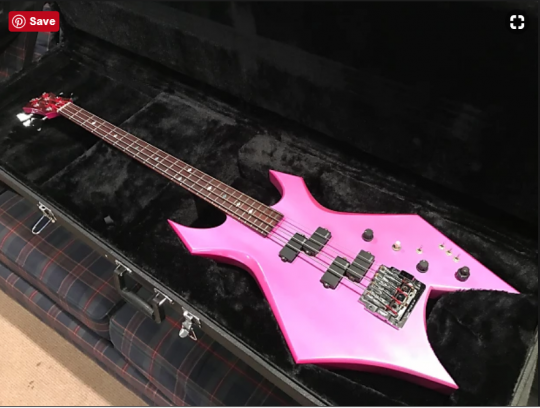 The hot pink bass guitar is super cool but I can totally see why you’d stick out like a sore thumb in a blues band – ha – but it’s super pretty. My younger son has a sax and played in the school jazz band for a few years, we always loved going to the concerts. Every once in awhile he’ll take the sax out and play it – such a treat! What a fun time in your life that must have been playing in bands! That kimono is so dreamy and chic! 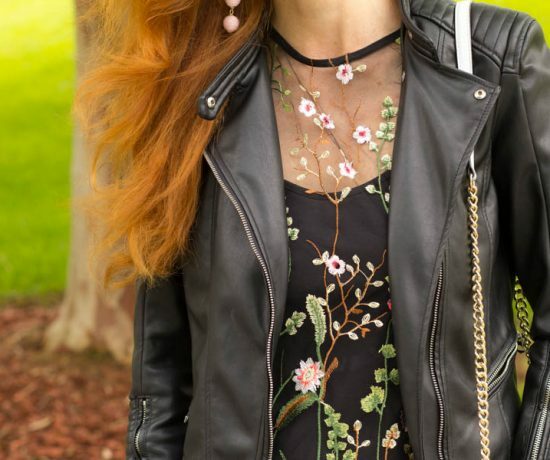 Love the dark floral print for winter. Your new velvet coat looks wonderful -the black column always the best base. The Jazz Rooms sounds so good – just my sort of place. I will enjoy seeing how you play with your style this year. That is soooooooo gorgeous-that’s an elegant way to branch out-Love it!